Maryville Baptist Church. We appreciate your concern for a Christian education. We believe children are a heritage from the Lord. It is our conviction to see that we do our part to reach as many lives for the Lord as we can. We have classes from Pre-school through 12th grade and Truth Baptist Bible College. For those who would like to have your child insured in a student insurance plan, Nationwide Life Insurance Company is offering a plan for Student Accident Coverage. 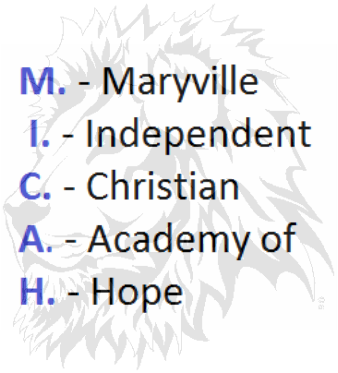 If you would like to receive snow closings, up coming events, report card reminders, etc., call the school office at 957-2856 and ask to be put on the MICAH email/text alert list.